"Enjoyed the variety of scenery and accommodation, the opportunity to speak French with our hosts and the walks to wear off at least some of the excellent food." R. Hirning & A McConnell, Canada. 12 nights accommodation in several charming guest houses in historic buildings full of character and interspersed with quality 3 star hotels and auberges, double or twin rooms with own bathroom. This unique self-guided walking holiday undertakes a beautiful circuit around the hills, gorges and historic villages of the Luberon Regional Park in Provence. As well as visiting some of the best loved historic hill-top villages in Provence such as Gordes, Goult, Lacoste, Bonnieux, Roussillon and St Saturnin les Apt, each with their own special character, your walking trail takes you off the beaten track into the higher hills and through some less frequented, charming hamlets and villages. On most of the days you'll have the choice between easy and more challenging walks, meaning it is suitable for those looking for a fairly relaxed walking holiday as well as those seeking a tougher walking trip. The holiday is available as a 10 night option with one rest day or as a 12 night option with 2 rest days. Our Panoramas of Provence walking holiday lets you discover Luberon's pretty landscapes covered with vines, lavender, orchards and forests, where small and bigger hills alike provide generous vantage points. Despite the popularity of this picturesque part of Provence, your walking holiday explores quiet trails inbetween the villages where each step is infused with the smell of Provence herbs. At the end of each day, relax by the pool and soak up the Provence sunshine at your delightful guest houses and hotels. 10 days independent walking moving between hotels and guest houses with two possible rest days. This holiday is suitable for walkers seeking both a moderate and more challenging walking trip. The moderate days have an average of 14km and +300m of ascent per day, whilst the more challenging options average 20km and +600m of ascent. You'll be walking on a mixture of small paths, tracks and quiet roads. The paths in the Luberon are often stony and rugged due to the nature of the geology, and so walking boots are recommended. Welcome in Avignon and transfer to hotel near Gordes. Choice of walks depending on your interests and length of walk desired. Explore the historic perched village of Gordes - probably the most famous village in the Luberon - and undertake a circular walk via Abbaye de Sénanque. Your walking tour takes you to Sénanque Abbey. Built in 1148, the abbey has housed an order of Cistercian monks for over 850 years. A guided tour of the abbey is possible and will allow you to visit the medieval parts of the monastery. Your path then climbs out of the Sénancole valley, with breath taking views of the abbey. Your descent back to Gordes is just as scenic, walking along ancient stone walls and among bories – dry stone dwellings. Short walk through the historic streets of Gordes and through fields to your hotel just outside the village. Other options include exploring the Vezoule Ravine or semacole gorge. 13-17km, +250m or +450m. Relax at your lovely guest house near St Saturnin with pool and great views. Visit the wonderful hill-top village of St Saturnin les Apt, nestled along the base of a long, low cliff, with the ruins of a castle above. Explore its pretty streets and climb onto the cliff for beautiful views of the Luberon before heading west through vineyards and orchards. The easier walking trail stays below the wooded slopes whilst the harder option climbs to the north to follow the top of the impressive Madeleine cliffs overlooking the hamlet of Lioux, which are 100m high and over 1km in length. Great panoramic views as you progress before heading south and climbing to the pretty ochre coloured village of Roussillon, which sits on top of a small hill and is classed as one of the prettiest villages in France. 19km or 22km, +290m or +600m. A mixture of delightful small guest houses in historic buildings full of character and quality 3 star hotels and auberges. They are located in wonderful settings, often on the outskirts of the historic villages. Warm welcome and fine Provence cuisine. Most of your guest houses have swimming pools. 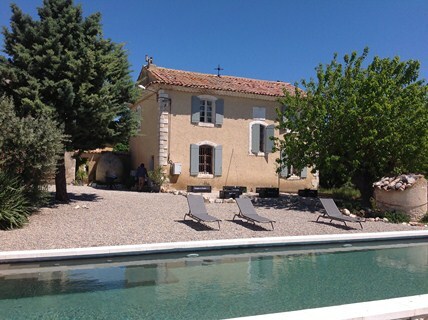 Below you'll find a selection of the accommodation on this walking holiday in the Luberon. Le Domaine Saint Jean B&B Chambre d'hote style guest house located in the houses making up a hamlet near the pretty village of St Saturnin les Apt. Original guest house with character where you can relax by the pool with views. Transfer from Avignon train station or Avignon airport is included in holiday price. Reduction in holiday price if you decide to take the regular bus journey to Beaumettes and a short taxi transfer from there to your hotel. Cost of bus journey: 2 euros. TGV trains run from Paris and Lyon to Avignon. During the main holiday season TGV trains run direct from London to Avignon. If you decide to take the bus, it's line 15.1 from just outside the TGV station. 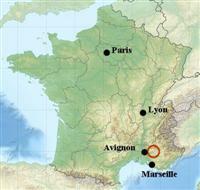 The closest airport to the Luberon is Avignon. There are regular flights from a number of UK airports as well as French airports. Flybe has services which run at certain periods of the year from Exeter, Southampton, Birmingham, Manchester and Leeds. We would be happy to book travel arrangements to France on your behalf for this self-guided walking holiday. Once in France, the journey from Calais to the Luberon takes about 11 hours (excluding long breaks). Tolls amount to about 55 euros each way. Non secured parking is available at your hotel near Gordes. Please inform us of this at the time of booking so that we can provide you with directions to your accommodation.